After a day on Lake Conway or perusing downtown's shops, retreat to this charming apartment for rest and recuperation! Inside, you'll find plenty of plush furnishings for everyone to find a comfortable place to sit, along with numerous amenities, like wireless internet access, in-unit laundry machines, and 4 flat-screen Smart TVs - so there's no debate over what to watch. When hunger strikes, easily whip up your favorite dishes in the fully equipped kitchen! Modern appliances and ample counter space make home-cooking more than easy during your trip. Savor all of your meals at the 4-person dining table! End the day on a relaxing note with a hot shower in one of the 2 full bathrooms. Afterward, bid everyone goodnight before slipping under the covers of one of the queen beds or the full found in the third bedroom. In the morning, wake up with a freshly brewed cup of coffee and a hearty breakfast! Recognized as one of the top ten places to live in the U.S., Conway is also an excellent place to escape to for an Arkansas vacation! 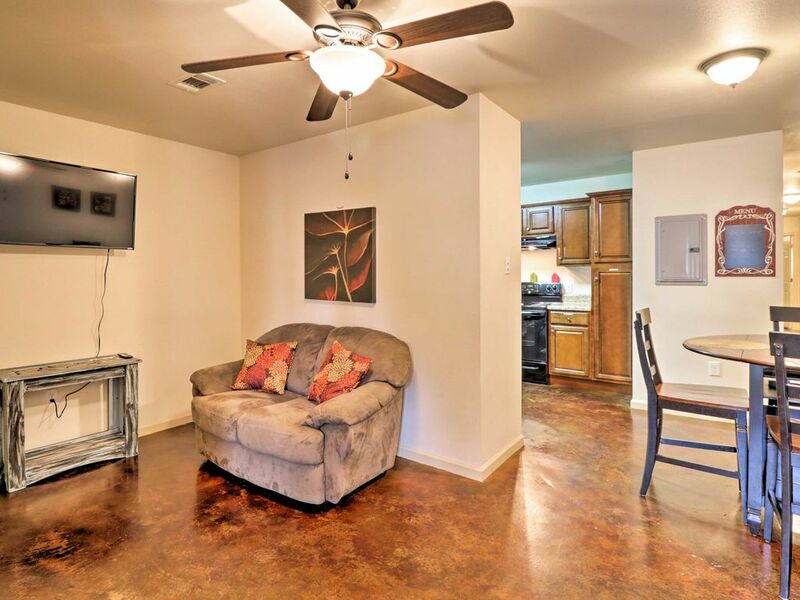 If you make this apartment your home-away-from-home, you'll enjoy easy access to all of the city's main attractions. Within walking distance, sits plenty of restaurants, cafes, shops, and bars - where you'll find yourself sipping a cold brew after a day on the lake. Conway also boasts a lively art and cultural scene, with a Shakespeare Theatre, symphony, and numerous museums! For more metropolitan luxuries, venture to Little Rock for its high-end eateries, boutique shops, and attractions, like the Rock Town Distillery and Arkansas Repertory Theatre! If you have kids in tow, make sure to add the Little Rock Zoo and Museum of Discovery to your to-do list. Back near Conway, you'll enjoy plenty of fun cruising on the waters of Lake Conway and Beaver Fork Lake - both located just minutes away. Bring along your own boat or rent one from a local marina for fishing, swimming, and pure enjoyment. But if you prefer land over water, don't worry! There's hiking trails in Pinnacle Mountain State Park, along with an extensive bicycle trail network that follows the edge of the Arkansas River. - Prime Conway location within walking distance of restaurants and shops, just minutes from Lake Conway and Beaver Fork Lake with fishing and boating, and within 40 minutes of Little Rock's attractions and Pinnacle Mountain State Park! We came to town for a wedding and were pressed for time and the code didn’t work. It took over an hour to get in. We attempted to get ahold of Stacy, the local manager, but could not get in touch with her. Luckily we finally spoke to someone from the property management company who gave us a code that worked (previous renters code). It was never reset (not the safest feeling). Two hours later, Stacy sent a code that didn’t work and we think was the code for a renter in the next building who knocked on our door because they had the same unit number in their confirmation email. Once we got in it had a weird smell but the place was really clean. It had towels, WiFi, and other amenities. Once we got settled in we realized the beds were rubbery and hard, and squeaked with every move. Later we shut it down for the night to go to sleep, and we realized the walls are paper thin because the resident neighbors (who had a car with a flat tires outside) were night owls. They were running power tools after 10, talked loud until after midnight, and left the tv on all night. We rented the apartment for Friday, Saturday, and Sunday but were greeted Saturday by the cleaning lady who said we needed to get out because a new person was coming and she needed to clean it by two. I had to call Stacy, the property manager, again to inform her we had another day of rental. She looked it up and said she would call the cleaning lady and let her know she put in the wrong address. Not once throughout this entire fiasco did she apologize or show any empathy for the issues we were facing renting from her. The place itself was what it looked like from the pictures and it was clean, but the quality of the beds, the neighbors, and the lack of professionalism from the manager is what made it an unenjoyable experience. We enjoyed our stay just needed hand towels and extra wash cloth, also the WiFi wasn't good at all. We had our granddaughter she couldn't go to her room to use the WiFi. Also couldn't watch tv for all the buffering. Also someone left their trash in the bottom of a cabinet in the kitchen. Everything was very clean and Love the colors. Very clean, nice house. Had everything including TVs with Netflix, YouTube in every room. Kitchen has all the stuff we needed. Overall very good experience. It was a Pleasure to be your host.. Again, thanks for choosing us as your hosts!! You were an excellent guest. Communicated well about arrival and departure time. The unit was well maintained during this visit. I highly recommend this guest for future stays and look forward to serving you on your next stay in Arkansas! Unit was nice on the inside. Clean, newer unit. Neighborhood is not the best but okay. Close to most everything. Couldn't get the TV's to work (probably didn't know how to use) or had to use the wi-fi from the planet fitness close by. Would help to have a welcome sheet on the kitchen table explaining these items. Other than that it was nice.